Let's hope lawmakers whose heads are turned by the Everglades Foundation's "buy the land" bus tour and petition drive also saw Thursday's South Florida Water Management District news. It dispels virtually every claim the Foundation is making. Tests show at least 90 percent of the Everglades, top to bottom, now meets ultra-clean water quality standards for levels of phosphorus of 10 parts per billion (ppb) or less as required by a federal consent decree and established under state law. Not only that, but 100 percent of Everglades National Park is below 8 ppb. Actually, 86 percent of the total Everglades is at 8 ppb. I'm just pleading for a little perspective here. The Environmental Protection Agency (EPA) reports more than one-third of the nation's lakes and rivers, except at their headwaters, registers a phosphorus level above 25 ppb. James Moran, SFWMD Governing Board member, is justifiably proud of the Everglades water data released Thursday. "The water quality targets needed for America's Everglades to thrive are being met thanks to our dedication and use of sound science over the past two decades," Moran said. "With the work already under way through Gov. Rick Scott's Restoration Strategies, we will restore water quality in the Everglades." Before the Florida Legislature passed the Everglades Forever Act in 1994, water flowing south out of the sprawling Everglades Agricultural Area (EAA) contained an average of 173 parts per billion (ppb) of phosphorus. For the past five years, phosphorus levels in Everglades-bound water have averaged 20 parts per billion after being filtered through the District's network of constructed treatment wetlands, known as Stormwater Treatment Areas (STAs). And now it's even cleaner. Much cleaner. I know the Everglades Foundation people don't want to admit it, but over the 20-year history of the Best Management Practices (BMP) program, phosphorus levels in water leaving the EAA dropped by an annual average of 55 percent compared to initial conditions -- more than twice the improvement required under the Everglades Forever Act. The BMP program has prevented approximately 3,055 metric tons of phosphorus from entering the Everglades. But I also realize clean water and a restored Everglades has little to do with the Foundation's motives for their lavish, con-job-of-a-pre-election bus tour. Nor is it about saving the Treasure Coast folks from damaging Lake Okeechobee discharges. This is all about buying land, taking land out of agriculture production. “Buying the land” will NOT allow the U.S. Army Corps of Engineers to send more water south. Didn't we see in 2013 and again from late January to November 2016 that Everglades National Park won't take lake water when the land is already so wet? Neither will the water conservation areas (WCAs). They are and have been above their federal flood regulation schedules all year. As engineers repeat and repeat, storage to the south only marginally helps the Everglades and WCAs when they can't take any more water. Southern water storage never was intended to reduce coastal estuary discharges. The solution to deal with the large volume of water coming from the North and from local basins draining into the rivers was determined to be north, east, west regional storage and deep well sites. Just another part of their campaign of misinformation. Click on the attachment below, the U.S. Army Corps of Engineers' Fact Sheet on CEPP. You will see the planning, engineering and Chief’s Report have been completed, and both the U.S. House and Senate have approved CEPP as part of the current Water Resources Advisory Act. What I want you to see in the Corps document is that CEPP already contains the EAA storage reservoir. After Restoration Strategies is built, and it's proved that CEPP can move more CLEAN water south -- we're talking 2021 -- the integrated delivery system calls for looking at the next increment of storage, if needed, south of the lake -- same as it says in the University of Florida water study. The A-1 and A-2 reservoirs have already been designed with a built-in footprint that could accommodate holding water 12 feet deep if there's the need and the funds to build that much storage -- with NO additional land acquisition costs. Florida lawmakers, please stay the course, keep the federal government focused on CEPP and let the Foundation's bus leave without you. Thanks, SFWMD, for the good news: The Everglades isn't dying, it's thriving. Every water body in America should have to show such progress. These maps compare phosphorus concentrations in the Water Conservation Areas before water quality improvement efforts began and over the last five years. Green dots represent sites with average concentrations 10 parts per billion or less. This should shed light on the false claims of the buy the land advocates. Hopefully, Florida residents who haven't been taken in by the land grab people will conclude that a land purchase would be a waste of taxpayer money. We don't need to buy more land. The good news about the water quality is backed by evidence which should, but probably won't, change the minds of Now or Neverglades people. I agree that the Now or Neverglades declaration with buy-the-land is a plan to buy farmland for real estate development. It's no coincidence that the land in Joe Negron's crosshairs is prime acreage for real estate development. "No matter what you hear from the alarmists on the bus, progress on Everglades restoration is undeniable" Fact is CERP should have been completed by now. Look at the original CERP timelines. I'm glad the water quality is good. But our leaders in the SFWMD and Tallahassee are getting it wrong. Very nice of them to wait till election time to do something right.....Also, I bet the phosphorous levels in Lake O, The Caloosahatchee, and Loxahatchee aren't low at all. I agree that it is not right for any agricultural areas to flood the water with pollution. Bringing a halt to that issue should be first priority! Thanks Nancy for a concise and accurate portrayal of the water quality in the Everglades...you're right that the agricultural community and thee scientists have now gotten it right and that the water quality is better...this is great news and it should be as one commenter wrote - the headlines in South Florida...but the mainstream media is in the pocket of the Everglades Foundation and their propaganda has duped so many people...but thanks for letting us know the TRUTH!!! All the above is fine - but WHY is the water NOT leaving the WCAs? We need to "PULL the PLUG" and get REAL amounts of water flowing under the Tamiami Trail one mile bridge, NOW! We need to improve the Flow-Way from there to Taylor Slough and thus to Fla Bay! The current NEW 6.5 Billion gallons per YEAR Flow is just a drop in the bucket of need for Fla Bay! If the Phosphorus level is so good, why not create a Flow-Way to avoid the CSS Sparrow's main nesting sites and get water out of the WCAs! There also needs to be a controllable gate system to allow water to leave WCA 3A and go into WCA 3B - to allow the WCA system to drain South, NOW! This accomplishment by the SFWMD should be the lead news story in South Florida. Even in the beginning, 1990s, the hope was for the STAs to get the EAA water to 50 ppb P. EAA and Lake O water was often well over 100 ppb P. The farmers (not just sugar by the way) started the BMP (Best Management Practice) program. They reduced the P in their run off by over 50%. Double the goal. That helped the STAs and the filter marshes reduced the P well below the expected 50 ppm to 20. Sending that cleaner water into over 600,000 acres of storage , the WCAs, brings it down to 8 ppb P. Ready to GO SOUTH under the Tamiami Trail, through Everglades NP and to Florida Bay. BUT. The water is not allowed to go into the Park despite being clean to protect the Cape Sable Seaside Sparrow. EPA single species protection. This year the WCAs were flooded with clean water from February to Mid August. During the worst of the bombs to the St. Lucie and Caloosahatchee. The water was stopped at the S 12s conveyances into the Park. That stopped all Flow out of Lake O south, the Lake rose above 14.5 feet and the USACE was forced to bomb the estuaries. It is not the SFWMD, nor the farmers (who don't like high water either) nor the USACE that cause the bombs down the C 43 and C 44. It is the Federal Agencies, US Dept of Interior and U S Justice Dept. Without dynamic unrestricted FLOW out of the Lake to keep it below 14.5 feet during the wet season ALL THE WAY to Florida Bay there will never be a way to stop the harmful discharges to the St. Lucie and Caloosahatchee. This article is an outright scam brought to you by the special interest groups that have been destroying our waterways, buying our politicians, and now coming up with fake news sources such as the Fort Myers Buzz and The Treasure Coast Star. All of this is being done in an attempt to protect their profits. Wanting clean water and wanting for polluting organizations to clean up their waste, is not radical. The organizations that are killing wildlife and endangering the lives of the people who live near the Caloosahatchee River, St. Lucy River, and Southern Indian River Lagoon are radical. You can see how they even post comments on this page to attempt to reinforce their lies. The people of Florida know who the real culprits are, and with the momentum that's been brought on by this year's devastating discharges, they will never stop fighting to restore the southerly flow and end the discharges once and for all. Do you really know who the "culprits" are? The pollution in the Lake comes from the Lake Okeechobee Basin. About 97% of the water, and pollution, comes from the north. Water does not flow uphill from the south without an unusual localized rain event. Jim, this article references scientific studies conducted by the SFWMD. Please reference sfwmd.org to confirm that the fact that water flowing from EAA farms is clean is true and not a scam. Also research the facts about how the BMPs that farmers use are so effective (can also be found on sfwmd.org) Over the last 20 years we've seen the internet, smart phones, the emergence of self-driving cars and believe it or not also proven, scientific methods to assure water flowing from farms is NOT polluted, exceeds the strictest water quality standards in the nation and actually returns water cleaner than received -- you would think the environmentalists would be thrilled at these advancements but instead they keep their blinders on and outright deny these FACTS and keep chanting "it's all beg sugars' fault". They need their scapegoat no matter what! I don't believe this article is a scam, because I've researched scientific documents by scientists with the SFWMD, DEP, Army Corps, FAU and many other third party scientists all coming to the same conclusion. Farmers are doing their part. Also, did you know that virtually 100% of water from EAA farms flows south - it is ILLEGAL for farmers to pump their water north into Lake Okeechobee? Many of my friends here on the east coast are totally shocked when I tell them about this fact. They also usually don't realize that during the big rain events we experienced this year, the Everglades became so saturated with water that the SFWMD would not pump any more water south for fear of killing the plants and wildlife that live there - so the mantra "send it south" was not an option if you didn't want to flood wildlife in the Everglades. This is a very complex issue and yes, the slow progress on projects already started to alleviate the need to pump water east and west need to be expedited because the discharges are harmful to the east and west estuaries. But to continue to blame farmers is simply unsubstantiated and unfair. They have more than done their part in being good stewards of their land and helping improve the water quality in Florida not to mention putting food on our plates. Militant environmentalists can't stand it when you use science and facts. This is not an advertisement article, and it reads contrarian to the rhetoric being splattered across the state disguised as a bus tour. I love my state and support 100% the protection and restoration of our natural resources. That does not mean that the environmental narrative is owned exclusively by radicals who use feel good politics and intimidation tactics to inundate those who use science and facts to support their positions. A perfect example of corporate welfare. Just why should we be buying their land to clean up their dirty water for them? ..... The answer is simple, pass a law fining them millions if they let out polluted water....... But instead they want the govs to spend Billions cleaning up their mess. .....And your state republicans are to blame and Nancy won't name them or or fight against this massive corporate welfare.... What's up with that Nancy? .........Why are Florida republicans not fiscal conservatives? Hmmm. DId you read the article? Seems like the mantra "it's all sugar's fault" blinds many to seeing the progress that scientists and farmers have made together over the last 20 years. Scientific reports conclude that farmers are not only NOT polluting the water flowing from their farms, they are exceeding the strictest water quality requirements in the nation. Over the past 20 years, farmers in the EAA have listened to the scientists, spent millions of their own money to implement Best Management Practices (BMPs) and have been so successful in removing phosphorus from the water that the farms now actually return water to the Everglades far cleaner than received from the lake. Farmers are literally cleaning up the mess that the populated Kissimmee River basin sends south to the EAA. Please reread the article and then do your own research by referencing scientific reports conducted by the SFWMD, DEP, Army Corps, or Dr. La Point of FAU Harbor Branch. Also I'd recommend your researching BMPs to learn how these farming methods have been so successful in improving water quality. You'll find that farmers are now part of the solution as their farms act as filters cleaning the water they receive from Lake Okeechobee. Farmers would most likely welcome your idea of fining those who do pollute the water as those fines would originate from the areas feeding the Kissimmee River Basin and from thousands of home owners who use leaky septic tanks and create dirty urban runoff. I would propose that some of the fines be used to help farmers pay for all of their efforts (BMPs) that have resulted in improving the water quality in Florida. Yet the farms still badly polute as the recent algae blooms show. ........ As does the need to buy land........... But as I said they need to buy the land themselves and clean their water before discharging it and not sticking the taxpayers for billions..... Yet under federal theat farmers have done better but still a long ways to go....... And yes septics need to be better yet no one mentions better ways like composting toilets, etc instead of massive, costly sewer systems...... Since any farmer not polluting will have no problem they should be for this.... The only fiscally smart, consevative way is for polluters pay, not the taxpayers. Do you despise Disney, The Magic Kingdom and those residing (yes residential) north of the Lake as much as you do commercial agriculture? Tell me when shall we bow in honor to the lush green lawns and landscapes with their concrete runoffs to the basins statewide? How can it be simply just "Corporate Ag" and not everyone combined? The dairies have been long gone or reduced to minimal levels above the lake. Citrus groves have disappeared by the thousands of acres and it their place we have ensured they won't return with commercially developed communities for the bus riders. Are we going to push for the restoration of the St. Lucie inlet that man dug to ensure boating; yesterdays means of moving products and today's recreational enjoyment. Shall we fight hard towards removing the C43 and 44 canals and let water flow as it once did? Whom of you on the bus decides who shall be flooded and who doesn't get flooded if we do this? I say that we look to the numbers of humans that would be directly impacted, i.e, flooded homes, lost businesses, the reduction of winter crops that feed so many beyond our borders and then see who's needs are greater. Restoring the southerly flow doesn't mean flooding people. It is not right for corporations to pollute and make populations along the coasts suffer. And stop attempting to encourage hate towards the people of Orlando when the problem lies with the companies within the EAA. FACT: 97% of the water flowing into Lake Okeechobee comes from the Kissimmee River Basin. FACT: It is illegal for EAA farmers to pump water into the Lake. FACT: Thanks to scientists working together with farmers to implement BMPs over the last 20 years, the water flowing from EAA farms is NOT polluted. It is in FACT cleaner than the water it receives from Lake Okeechobee and exceeds the strictest water quality standards in the nation. FACT: In high rain events like this year, the Everglades becomes saturated with water and the SFWMD won't allow the water to flow south as it would flood the plants and wildlife in the Everglades. OPINION: Seems like nearly 100% of the militant environmentalists message is to take productive farm land out of production. I don't understand the hate towards farmers. This article is a perfect example of marketing strategies to the max. 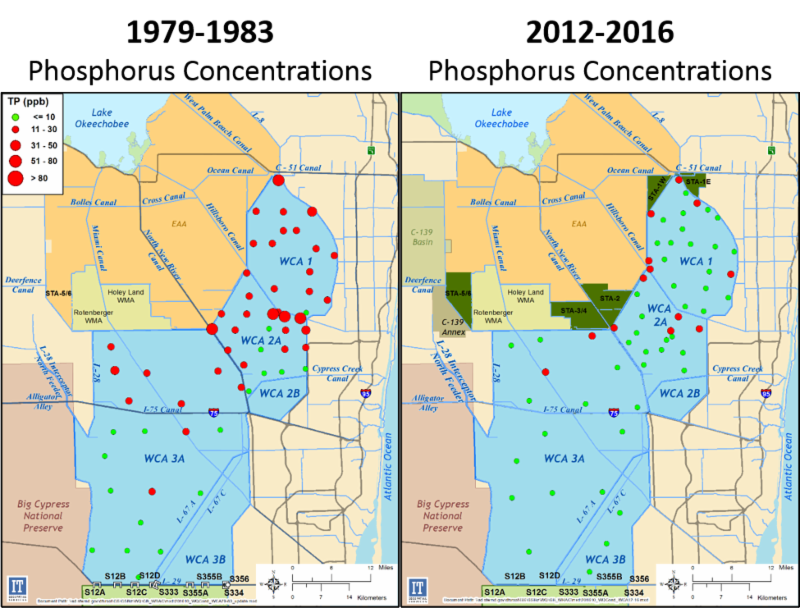 Water quality in the WCA 1, 2A/2B, and 3 is thanks to more water retained north by polluting other rivers and estuaries like the St. Lucie and Caloosahatchee. So basically, we are still polluting our vital water bodies, but at least now we get the choice of which ones we wish to pollute at any given time. But given the source, I'm not surprised The fact this article attempts to link water quality in these conservation areas to an argument against further land acquisition and land management south of Lake Okeechobee is abhorrently and grossly ignorant of scientific realities. So help me understand this situation, the state and Feds already own about 1/3 of the Florida land, farming, citrus and ranches comprise another 1/3, and the rest is populated for the most part. That means 1/3 of the land is exempt from taxes and buying more land not only uses public money but also removes these lands from the tax rolls thus forecasting a short fall that would require higher taxes. I fail to see land acquisition as the answer but do see better land management. It is fact that Federal and State owned land is not managed as well as private property. I may be wrong but it's my opinion.